It’s a love story and she just said yes. 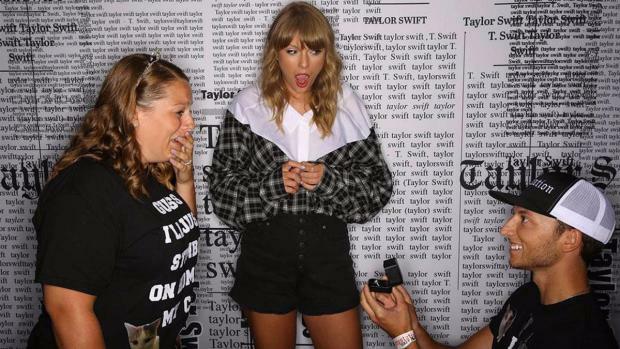 A Swiftie couple got engaged Friday night in front of Taylor Swift during a Philadelphia performance of her Reputation Tour. The couple, Anthony and Stephanie, met Swift at a meet and greet in the Rep Room, according to a Twitter account dedicated to the proposal. There, Anthony got down on one knee and popped the question, eliciting a jaw-dropping reaction from both his girlfriend and the pop-singer. It was the night of a lifetime for two Taylor Swift fans at the superstar's concert in Philadelphia Friday. The two got engage during a meet-and-greet with the singer! The couple told Swift that they began their relationship in 2013 at a Red Tour show in Philadelphia and that her music played an important role in their relationship. In order to prepare for the proposal, Anthony started the Twitter account Philadelphia Show Proposal to attract the attention of Taylor Swift and her fans. “I want to give my girlfriend the proposal of her dreams! Help me spread the word so Taylor can see this. I know Taylor can make this night unforgettable,” he wrote in a June 3 tweet. Anthony asked followers of the account for advice on everything from when to propose to how he could get Swift's attention. The couple has received a lot of love from Swifties on Twitter. While they appreciated the support from fellows fans, it was making Swift's Instagram that made the proposal truly memorable for the couple. After a whirlwind night, the couple headed back to the concert on Saturday for round two.